Xfce is by now an old desktop environment, with years of development and an existing community. 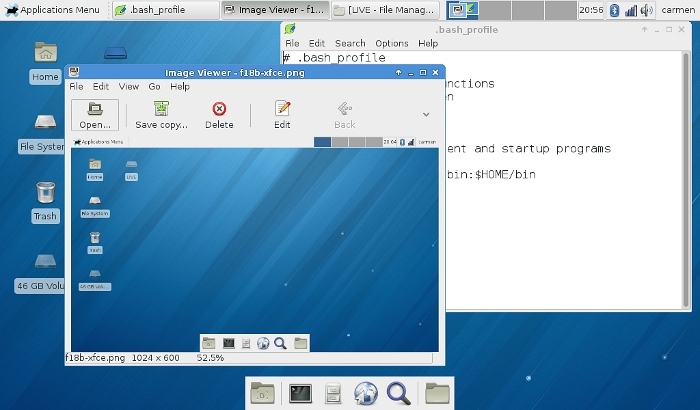 When GNOME changed drastically, it was seen by many as the de facto replacement (before, it was seen by one as "GNOME Lite"), an important number of users adopted it, even Linus Torvalds used Xfce for a while. The desktop is kind of basic, even now it looks better it still lack polishing and features and the included apps are limited in functionality. The development rate is not as fast as you may want, technically it feels a few years behind. Of course, being a GTK+ 2 desktop, you can run any GTK+ 2 (GNOME 2) applications seamlessly (note: major GTK+ apps like GIMP or Inkscape are still GTK+ 2 based). The ideal target for Xfce are users with a limited need to fiddle with the desktop, who spend most of their time either in the terminal or a few apps and need a shell to launch those: either newbies or techies. Still young, Cinnamon does not have yet a dedicated Fedora spin of its own, so you can install it with yum (yum groupinstall cinnamon-desktop) on an existing installation. I did it over the Xfce spin, but it may be a good idea to install from a Desktop (GNOME) spin, as it would re-use most of the GNOME stack and apps, or even from the net-install image, if you want to keep the footprint low (none of the desktop presented here are available on the install DVD but they can be yummed later). The desktop feels like a mix of elements from GNOME 3, GNOME 2, Windows, KDE and others, is like GNOME 3 a "modern" desktop but with a different vision. There are a lot of inconsistencies in its look: some apps have dark windows, some have light windows, some icons are flat, some not, you can easily see the team is small. On the apps side, everything is there: since Cinnamon is an alternative GNOME 3 shell, it uses all the GNOME apps. Honestly, I am not sure what is the intended audience for Cinnamon with its mixed feeling, I guess those who want a change, but not that much in the GNOME's intended way. Another project from Mint, MATE is as simple as a direct GNOME 2 fork, with a few bug fixes and backports on top. It looks as gaining momentum and Fedora 18 Beta with MATE is receiving rave reviews. Just as Cinnamon, MATE does not have a dedicated spin yet (look forward for one in Fedora 19), so you can get it with yum groupinstall mate-desktop from an existing install. The desktop has an identical look and feel with a GNOME 2 desktop, since it is a direct fork of it: after install you will be in a 100% traditional GNOME environment. 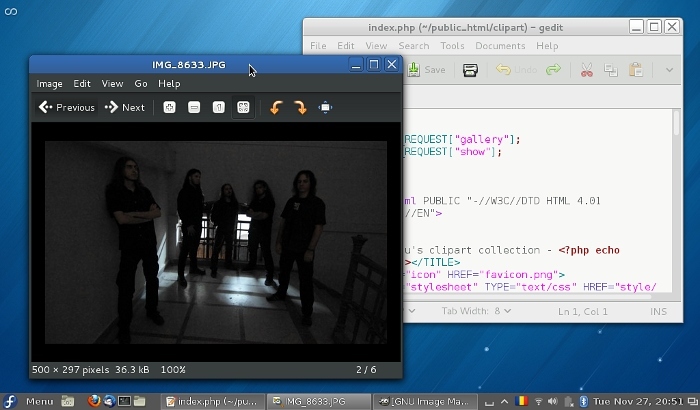 All the apps included are forks of the GNOME 2 apps, from Nautilus to gedit and eog. They have the name changed so they can live together on the same system. What will happen when the major GTK+ apps will move to GTK+3 remain to be seen, but that's distant future anyway. If you want to pretend GNOME 3 never happened, then MATE is for you. That is its intended audience. Even if at this point it is vaporware, GNOME developers announced a "Classic" mode, it's going to be a set of extensions on top of the shell, giving a more traditional feel. This is not Fedora material, is just a proposal. When/if released we'll see if it is too late and/or too little, for now it looks mostly like a move to limit defectors. No GNOME Fallback on Fedora? Being unhappy about the directions of gnome3 is one thing but spending a million hours going through alternatives is just meh .. It is really easier to just accept gnome3 and modify the parts you dont like by using extensions. Every protest movement have a life time. The great gnome3 protest is starting to become an old farts club. MATE is stalled on old libs and XFCEs fame kind a died with Linus feft. ^^^ i smell an anonymous gnome dev troll!!! back, back you beast. the only thing that is fading away is gnome3. the gnome developers are incompetent. and there product is garbage. crying like a baby and throwing a tantrum because no one likes your product only makes you look like a**holes in addition to being incompetent. i am a long time red-hat fan. going back to the days when i downloaded red-hat as 5 floppy disk images. i am disgusted with gnome. i use xfce now. i will probably install mate when it is available in the main repos. but honestly xfce has everything i need. i hope red-hat replaces gnome as there default desktop. and i hope they stop supporting development on gnome. gnome do not deserve it. i will not use cinnamon because it is a hack of a broken and badly thought out desktop. i will also not use gnome3 with 'classic' plugins. classic? they are in denial that there 'new' code is a broken badly though out design. there is nothing new about bad code. I don't care for Gnome 3 at all. I was happy with Gnome 2, and I've quickly learned to get most of what I want from Xfce. I hope that alternatives to Gnome 3 remain available. That sort of freedom of choice is what makes us use Linux instead of Windows. Well, Linus is back using GNOME 3  and he has tried KDE as well. FOSS desktops are going forward and I think people should stop whining. Excuse me... what? read the piece above again, is about people happily running alternatives. PS: this is WWW, you can use hyperlinks, no need for footnotes like in a book. Most of the comment sections in blogs I read converts links to HTML form so I have used to just paste them directly. I use Linux for nearly 20 years for everything. I have used all desktop environments, but when GNOME3 came along, I switched to XFCE. It is fast. It is excellent and does everything you will need from a desktop environment. I install various GNOME applications, in particular the excellent gnome-terminal. Anyway, it is fully GTK compatible and has really easy to use and pleasant interface. "Well, Linus is back using GNOME 3  and he has tried KDE as well." now the gnome true believers are resorting to deceptions to try and push there garbage-ware. as of Nov 1, Linus IS USING KDE... its unbelievable how pig headed and suborn some people are when they are confronted with there shortcomings. no no, its not me that messed up its the WHOLE WORLD that is wrong. honestly regardless of what Linus is using atm. don't you think its just a little bit of a bad sign when Linus goes screaming in horror away from gnome3? and a huge portion of the gnome users do the same. and new desktops spring up like flowers? o wait i forgot, the WHOLE WORLD is wrong, and a small group of smug insular developers who make a free desktop for the x are right... silly me. "FOSS desktops are going forward and I think people should stop whining." wait, who is trolling this thread and whining about non-gnome desktops? YOU are its the gnome true believers whining and throwing a tantrum because people want to use other FOSS desktops. its the gnome trolls who are taking cheap shots at other desktop and whining because people have moved on to greener pasture with no intention of looking back. FOSS desktops are moving forward. it shows how egotistical and out of touch gnome devs are that they think that 'FOSS desktop' only apply to gnome3. every desktop and window manager has there own 'vision' and people are voting with there feet. no one likes gnome3 and they have options. you need to GET OVER it and stop whining. the fact is gnome3 is moving forward on a road that runs off a 10,000 kilometre cliff. its amusing to watch but you wont find many people who will get in the car with you. the gnome developers are incompetent and the gnome3 design is deeply regressive and a step backward for usability. the first step in rehabilitation is to admit you have a problem. as for the rest of the world we will be moving ahead... on other desktops with a smarter and more functional design. OK, I see ... anyway, I'm a XFCE user myself. Dear Mr. Anonymous. I would disagree with you. GNOME3 (GNOME Shell, call it as you like) is just a tool. And a tool, surprisingly, is as useful as its user is capable of and willing to use it. Tool can be great or not, but even great tool in hands of incompetent user will preform poorly. 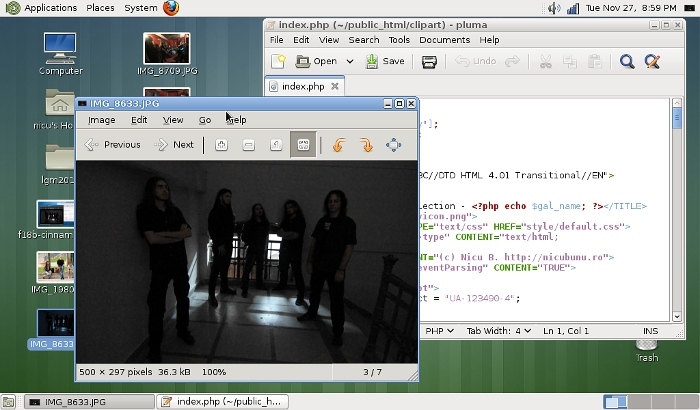 It is just an example and I do not suggest that people who do not use GNOME 3 are in any way "incompetent". For me G3 is not perfect either. I admit that it has its shortcomings but people should really stop whining. Why to moan constantly about something when you do not have to use it? Just leave it and forget. Isn't it a good idea? I use G3 and I'm happy with it. It makes me focused on a task. I can use it to perform quickly and effectively. Really, it is just a matter of will and time to suit it to your needs (http://extensions.gnome.org can be really useful) and make great tool out of it. If you need any help with GNOME3 - contact me on D* (https://pod.orkz.net/u/marekjm). PS. It may be that my first DE on Linux was G3, so I was not given the chance to taste anything different. After all - I find G3 pretty good DE. I'd like to see a Unity desktop available for Fedora. I like Unity but dislike Ubuntu. This combination would suit my needs perfectly. a couple of years ago AdamW started such a project but abandoned it later. I'm not sure what is the state of this port but at least some work has been done . It's possible that Canonical's efforts to bind Upstart more closely with their desktop and their decision to use older patched versions of upstream GNOME components may cause some bigger problems as well. "I'd like to see a Unity desktop available for Fedora. I like Unity but dislike Ubuntu. This combination would suit my needs perfectly." this could be inevitable if Unity has major optimizations which make games run faster and smoother then other desktops. i'm thinking about STEAM client. they have been working to integrate STEAM. and that is the sort of thing that grows the user base. games are a big attraction for non-technical people who would use linux if it had steam. if Ubuntu starts to pick up new users and Unity runs faster for games then it could become the de-facto desktop in short order. STEAM users won't care much probably about the desktop, they want a button to start the gaming interface, that's all. the desktop environment itself won't matter much, but X will matter, drivers will matter, OpenGL support will mater. if Ubuntu does those right, they may get a huge boost in the desktop Linux world. i don't care much for Unity. but i think Canonical is making a really smart move with there STEAM support. it has a real shot at increasing the non-technical user base. more power to them if they can do that. i will definitely buy some games when STEAM comes out. and do some benchmarks on Ubuntu to see how the performance is. i would usually never install Ubuntu. but will try it just to see how good there gaming system is. i am using myself Windows at home only for games (dual boot), would like a lot to escape that. Gnome3 is slowly dying and I'm garbing popcorn for it's demise as all major distributions are running away from it. And since RH is the only one that needs a desktop for the next RHEL I hope it will fail in flames because they are pushing so much against the tide. Tested for a while Scientific Linux, but IMHO, the programs are a bit outdated, specially for desktop usage. So MATE it is... And it looks rather nice.